Most Carnival Glass patterns – and certainly most of the Classic USA ones – were named by early collectors/researchers, such as Marion Hartung and Rose Presznick. It’s rare to come across a pattern name that was given by the maker at the time of production – but what a delight to know that we do indeed have knowledge of several actual pattern names that were originally given by Imperial. ​The source for this precious information is Imperial’s Catalog 101B, issued in 1915, featuring “Iridescent Glass Novelties”. Many of the familiar designs shown were named and described by Imperial. Sadly, of course, these original names were not known back in the 1950s and 1960s, when the early collectors began to assign their own names to patterns. But it’s important that we acknowledge and know them now, and learn as much from them as we can. Imperial called this their “Persian Design” or “Persian Pattern”. ​It’s most interesting to note that Imperial called the 9” flat plate a “bread plate” and indicated that it was being made in three iridescent colours at that time: Rubigold (Imperial's colour code M), Azur (code L) and Helios (code K). Rubigold was Imperial's name for marigold, Azur was their purple, and Helios is the same term we use today. ​(the original catalogue image was very indistinct). In using the names “Persian Design” and “Persian Pattern”, Imperial was indicating that the inspiration came from Persian arts and crafts. ​Could it have been intended to represent a peacock feather (eye) design? Or perhaps it was inspired by something like the Persian silk textiles and rug designs shown on the right. We will never really know! centre: another silk brocade from 17th century* and right: the central detail from a Persian Qum rug. *both of these were shown at International exhibitions in the early 1900s. ​​Known to us by the familiar name Heavy Grape today, this strikingly lovely design was originally called Colonial and Grapes by Imperial. ​The simple, early, panelled pattern was often known as Colonial style by many of the USA glass makers, and indeed Imperial made a range of bowls and other items that they referred to as “colonial ware” or “colonial style”. ​On the exterior of the Heavy Grape pieces is that exact pattern – the colonial panels. Carnival collectors call this panel pattern Flute. Four colours were offered: Rubigold (colour code M), Azur (code L), Helios (code K) and Old Gold (code R). Old Gold was Imperial's name for amber base glass. ​​Right: Heavy Grape master berry and individual berry in smoke. The Heavy Grape pattern is on the interior of the items and is referred to as such in the Imperial ad which calls the piece "Colonial and Grapes", saying that "the inside of this bowl shows a gorgeous grape design". American Beauties was Imperial’s name for the pattern we know as Imperial Rose, or more specifically as Open Rose (for the footed shapes) and Lustre Rose (for the collar-based shapes). ​Imperial intended them all as the same pattern range, all featuring the American Beauty Rose. ​Helios (code K) and Old Gold (code R). 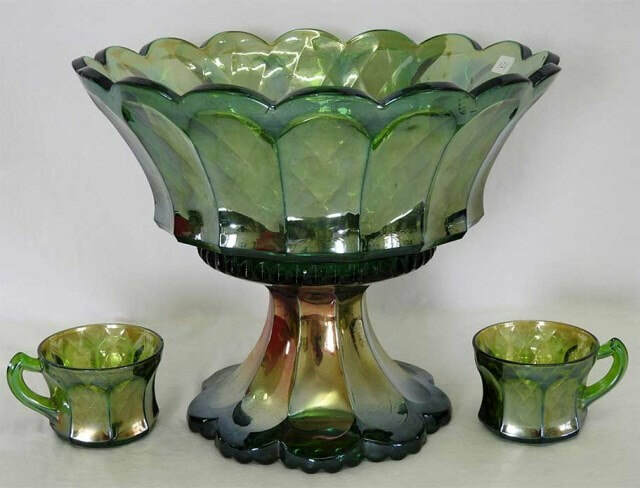 The exterior design on the Open Rose bowl shown here is as exquisite as the interior pattern. Imperial were very proud of the fact that they invested much effort in producing pleasing exteriors too. Here’s how they used it as a promotional selling point in their catalogue, alongside their American Beauties. Above and below: a purple centrepiece, footed bowl, a shape that Imperial called a low footed salad in their Catalog 101B. ​Shown courtesy of Alan Henderson. Roses have always been a favourite flower, as seen in the USA fashion journals of the time (see the 1912 extract on the right). You can read much more about the American Beauties (Open Rose and Lustre Rose) in the major feature on our website that also includes Contemporary and Finnish production of the pattern. Read it all here: A Rose By Any Other Name.